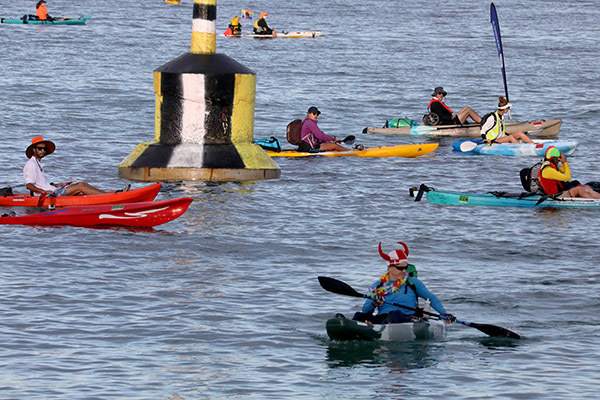 The concept for Sculpture by the Sea was the culmination of many years thinking, where a new step in the thought process came up every year or so. Essentially the exhibition came from my wish to create a major free to the public arts event for Sydney. 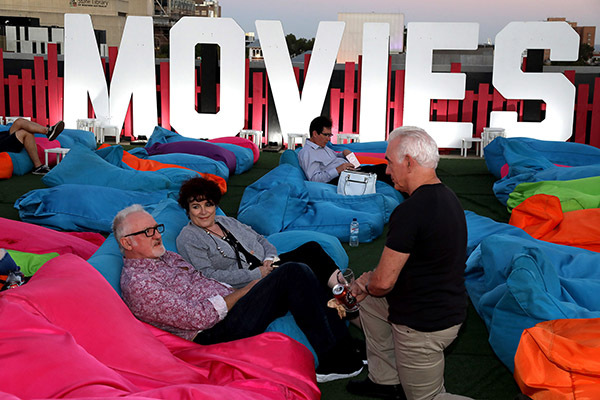 Like so many other people I have always loved large community arts events like ‘Opera in the Park’ and ‘Symphony Under the Stars’, especially the way total strangers sit next to each other listening to music while enjoying a picnic dinner and a few glasses of wine. 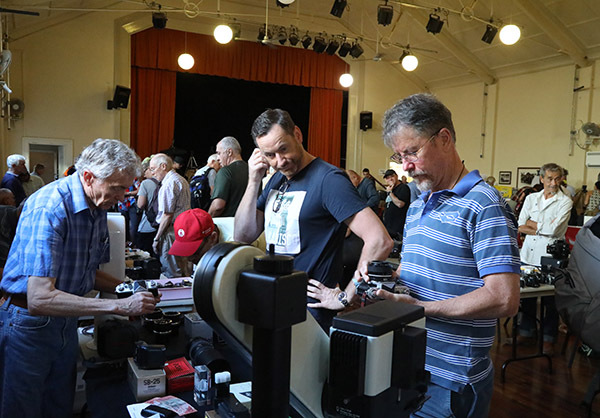 To me this sense of community is too rarely displayed or available in the modern world where there are few opportunities for seriously enjoyable cultural activities that are free and not fringe (but hey, long live fringe!). 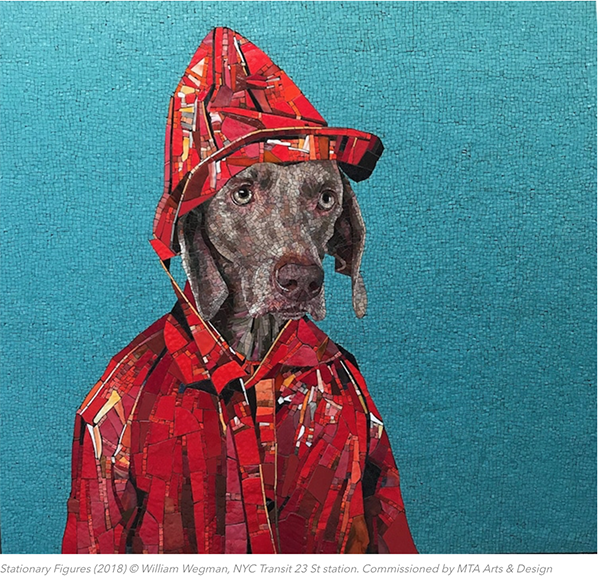 Pretty much straight away I thought there was a need for an accessible visual arts event in Sydney but the ‘what and where’ took some time to nut out especially as I did not have a visual arts background. While running away from the corporate world and living in Prague in the early 1990’s I was taken to an outdoor sculpture park set amongst 13th century ruins near the town of Klatovy in northern Bohemia. Playing amongst the ruins and sculptures one night with my Czech art school friends I had my first experience of the power, if not majesty, of sculpture. From here my thoughts for the ‘event’ I might one day put on began to turn to sculpture. Returning to Sydney, in 1996 friends who knew about my idea suggested i take a walk along the Bondi to Tamarama coastal walk (thanks Marie- Violaine and Matthew). All around me I saw natural plinth after natural plinth where sculptures of all descriptions could be installed. At the time I was expecting to land a major film job any day so the idea for the exhibition was put on hold until I realised the film job was not going to come through. With nothing scheduled in my life for several months, I thought I would set ‘Art by the Sea’ in motion – as I was still thinking of including paintings. It did not take more than a day to realise paintings would be an absolute liability in the wind and sometimes rain of the cliff-top walk. So that idea was dropped. 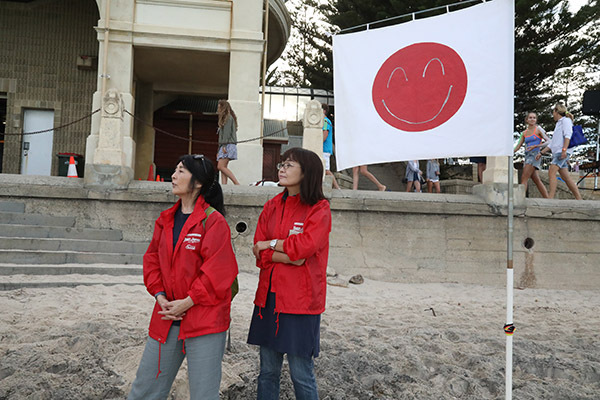 Fortunately for the exhibition, by now called Sculpture by the Sea, a number of key people fell for the idea and helped to make the exhibition a reality. Chief among these people were Anita Johnston at Waverley Council, which is responsible for managing the coastal walk, and Ron Robertson-Swann OAM one of Australia’s most recognised (if not occasionally controversial) sculptors. 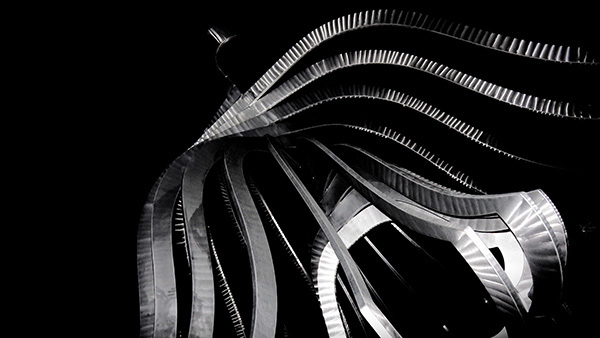 From the first phone call Anita was enthusiastic and guided the exhibition through Council’s environmental, safety and crowd management issues, while Ron advised on matters relating to installing and siting sculpture in a vast outdoor environment. Of equal importance Ron put his reputation behind the exhibition introducing many other substantial artists toSculpture by the Sea and thereby ensuring from year one that we had an exhibition of a high standard. Obviously many more people were crucial for getting the first exhibition off the ground but without Anita and Ron nothing would have happened. In the exhibition’s first year, 1997 (and still far from resolved now) our biggest problem was financing the show. 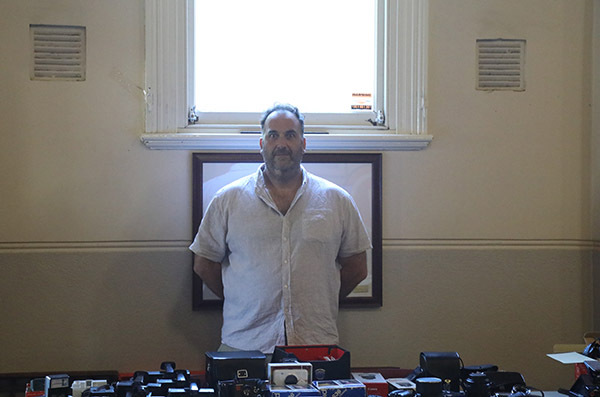 Run from my lounge room and staffed entirely by volunteers, none of whom knew each other before hand, the first exhibition started with a bank account of $100. 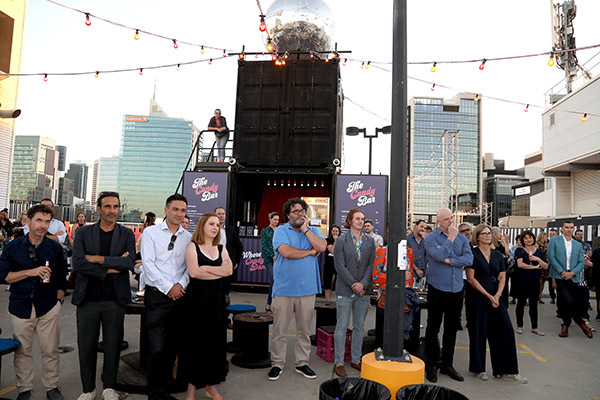 Some of the volunteer crew were sensational and within no time we had over 100 artist submissions for the show, media interest, Council approval and a principal sponsor in Sydney Water which put up $5,000 for the first Sydney Water Sculpture Prize and also assisted with advertising costs. 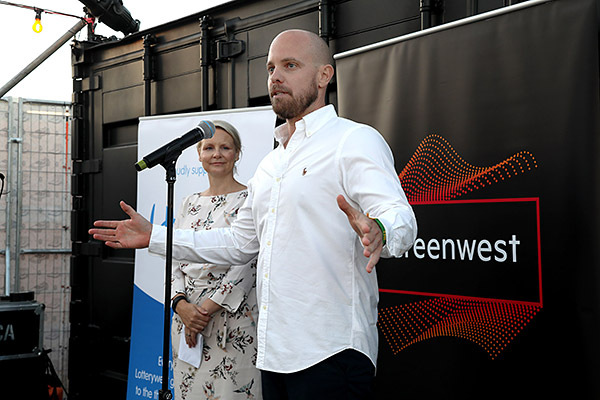 Produced on a shoe-string budget of $11,000, of which $8,500 went to the exhibiting artists in the form of the artist awards, the first exhibition was hustled together in 10 weeks. Given that we had no budget for security the first exhibition had to be limited to daytime and therefore to one day only, but this had the advantage of allowing Waverley Council to see how we produced the show before being prepared to authorise us to stage a multi day exhibition in 1998. 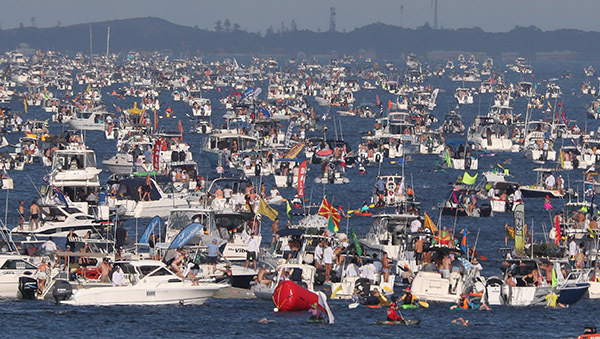 That 25,000 people visited the 1997 exhibition, the quality of the show and the media interest gave the impetus required for the future development of Sculpture by the Sea. But given the fact our first major sponsor dollars did not show up for nearly 12 months it was a very hard time. 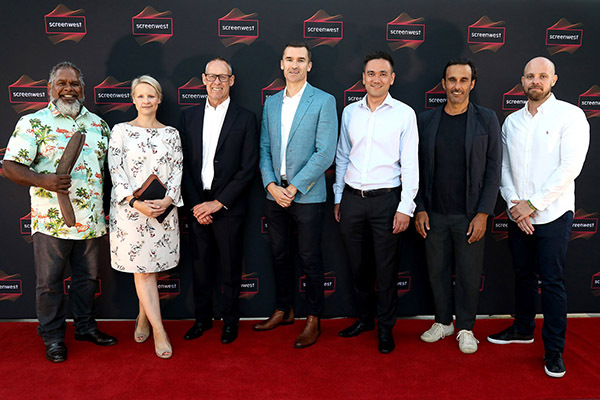 For 1998 the Sydney Organising Committee for the Olympic Games (SOCOG) through the Artistic Director of “A Sea Change” Andrea Stretton, commissioned five Sculpture by the Sea exhibitions around Australia for the 1998 Olympic Arts Festival. 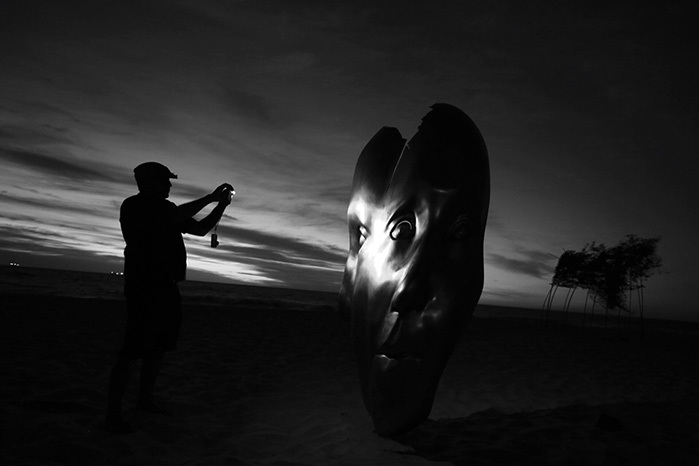 This was a huge step up for us and one which artists really responded to with over 260 sculptures being installed among five locations around Australia (Darwin, Noosa, Albany, Bondi and the Tasman Peninsula). It was a pity not to be able to maintain each of these interstate exhibitions but without the SOCOG funding – which was fairly limited any way – it was not feasible, though we tried to keep Tasmania running with an exhibition included in the 2001 Tasmania wide arts fest “10 Days on the Island’. I loved this Tasmanian show and it was a pity that it was not financially feasible to keep it going. At least we now do the smaller, lovely ‘Ephemeral Art at the Invisible Lodge’, so we keep our ties with Tasmania. 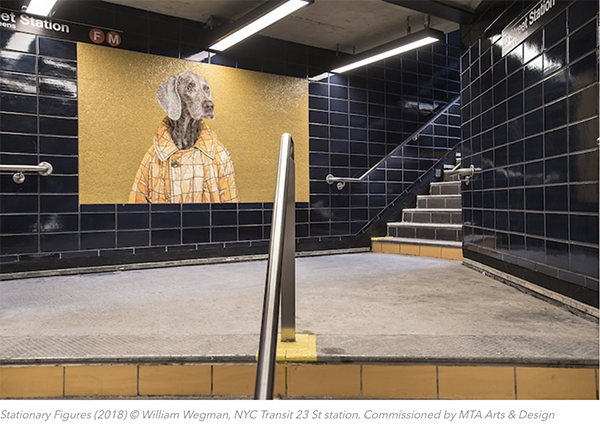 From 1998 on the challenge of producing the exhibition was to attempt to stay in tune with the artists’ and the public’s expectations while growing our financial resources. To this end our major developments have been: (i) extending the exhibition over three weeks; (ii) significantly increasing the support we provide to the artists in the form of awards and in some cases subsidies, in 2007 this was over $300,000 (thank you to our sponsors and private donors); (iii) developing ties with overseas sculpture organisations that see two dozen overseas artists exhibiting every year; (iv) developing the exhibition’s sales, which totalled over $1 million for the first time in 2007; (v) encouraging those artists who incorporate the sun, sea, wind and rain to continue working in this area by developing an Environmental Sculpture Prize; and (vi) developing our schools education program in which over 1,600 students participated in 2007. 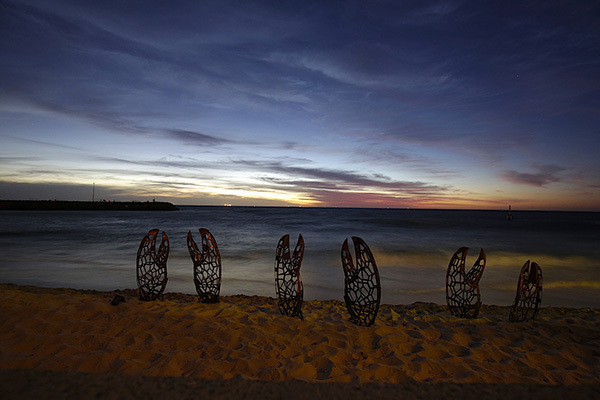 The most substantial development in terms of our organisation has been the establishment of Sculpture by the Sea incorporated (SXSINC) as a not for profit incorporated association to run our exhibitions. In this regard the company that previously produced the shows has given the rights to the exhibitions to SXSINC. 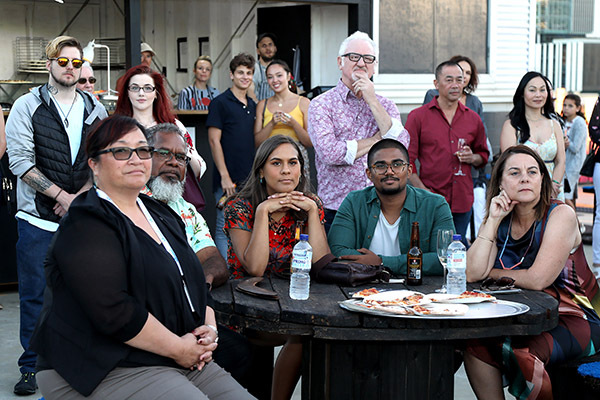 Establishing SXSINC and its listing on the national cultural register has enabled us to provide our private patrons and friends with tax deductions for their donations, aswell as allowing access to grants from philanthropic foundations. In this regard we are very appreciative of the support of the Balnaves Foundation with Neil and Diane Balnaves our Bondi exhibition Patrons. 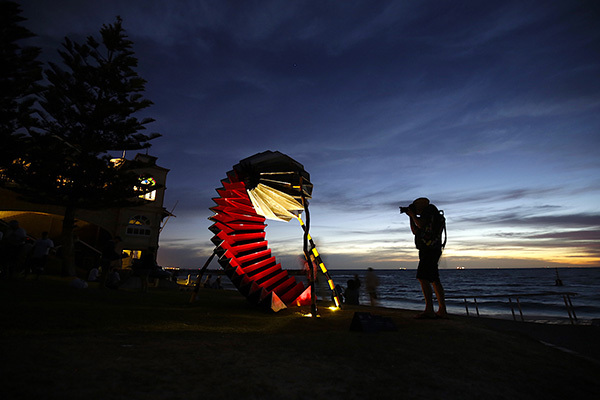 In 2005 we launched Sculpture by the Sea, Cottesloe, held annually at Cottesloe Beach, Perth on Australia’s Indian Ocean coastal. With its sunsets, long horizon and the gorgeous pocket of beach near Indiana Tea House it’s a wonderful location. It has been an exciting, frightening and busy time and to everyone involved and in particular to the exhibition’s staff, sponsors, our Board and most of all to the sculptors, thank you for coming along for the ride. Ukrainian digital photo artist Tetyana Dyachenko skillfully brings damaged and seemingly destroyed photographs back to life. Her retouching talents, attention to detail, and unwavering patience are each apparent in her impressive portfolio of restored vintage photos. Using Photoshop, Dyachenko is able to expertly reverse even the most severe damage. She can smooth creases and wrinkles, mend tears, erase water damage, correct color imperfections, and even patch up extensive holes and missing pieces. 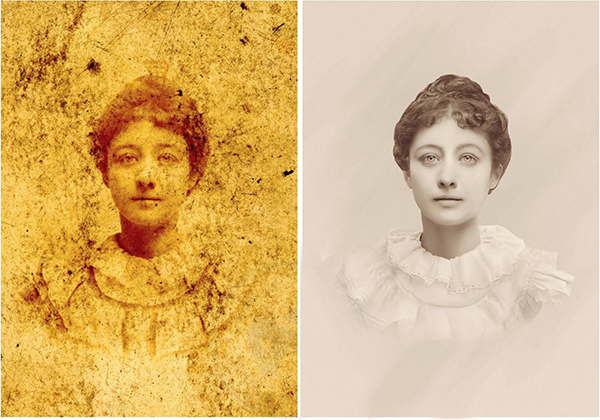 Even if a piece hasn’t suffered any substantial damage, she often freshens up the inevitably faded pigmentation, improving the aesthetic quality of the photo as a whole and allowing the subjects’ smiles and stares to finally shine through once again. On her website she shows her specialised digital work for magazines and photographers who need aesthetic enhancement of their photos as well. 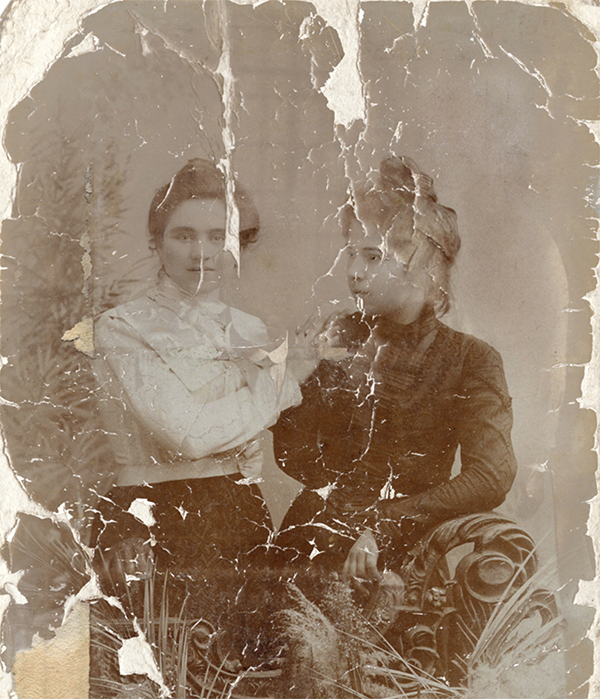 Dyachenko uses her talent for a range of restoration projects; with no single speciality, she can transform formal portraits, family photos, and everyday pictures from any era. 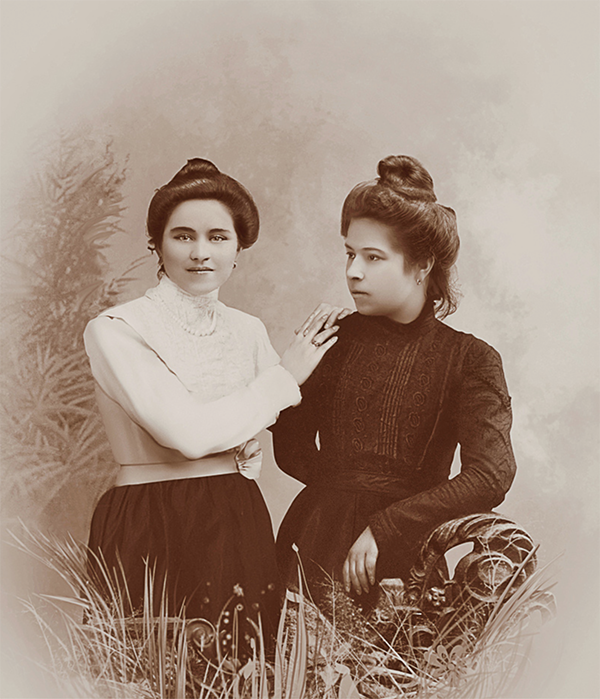 If you have an old photo of a loved one in dire need of touching up, you can contact Dyachenko (and see more of her unbelievable work) on her company’s website. West Leederville Town Hall: early morning Perth, Australia. 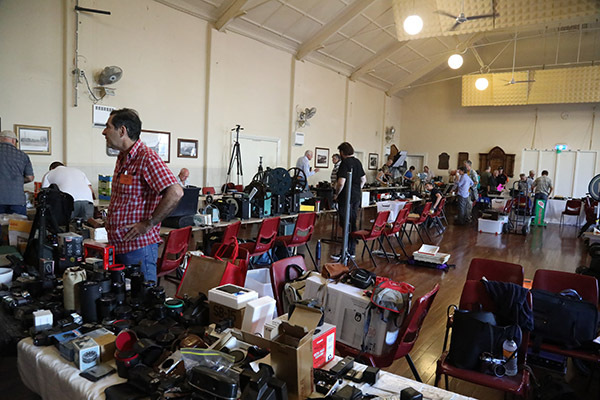 The traditional Photo Swap Meet. 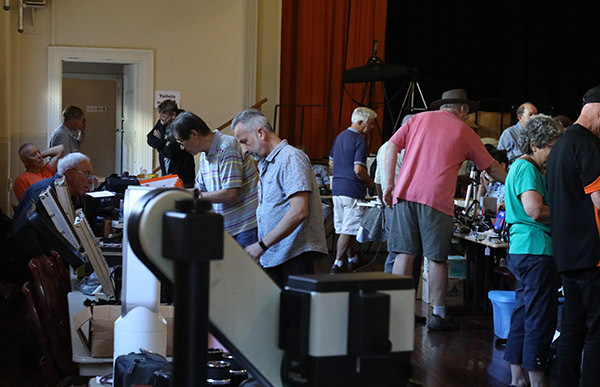 Photographers, collectors, historians gather early to dispose of a lifetime involved in the art of photography. as the autumn sale gathers momentum and the morning moves on. to another old camera bag. There is mystery in old cameras. And it attracts all manner of new owners who will be back for the next swap meet. 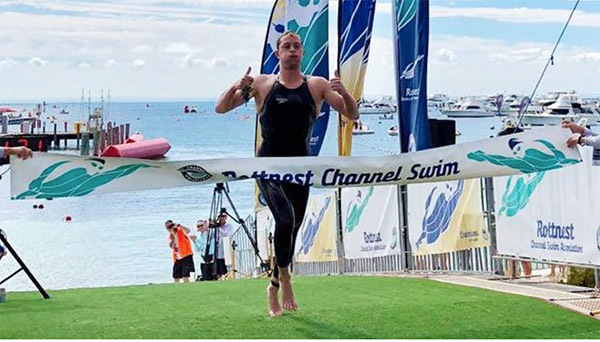 Victorian open water swimmer Sam Sheppard has taken out the Rottnest Channel Swim on his first attempt at the gruelling 19.7km swim solo from Cottesloe Beach to Thomson Bay. 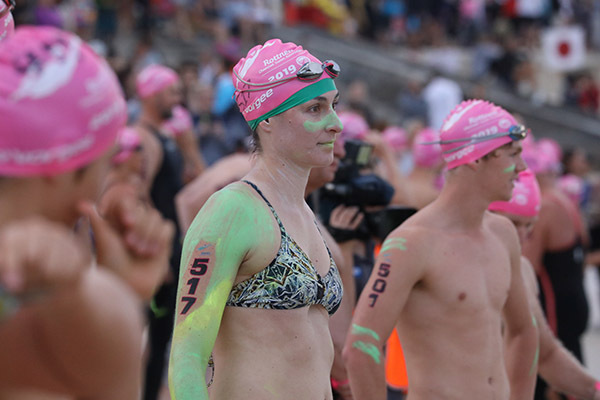 The 29-year-old led the swim from Cottesloe, crossing the finish line 800m in front at a time of four hours and 11 minutes. Sheppard said the conditions were perfect and calm. “The last couple of kilometres were pretty tough but I’m really happy with the result,” he said. “My plan was to get to 10km and pick it up. 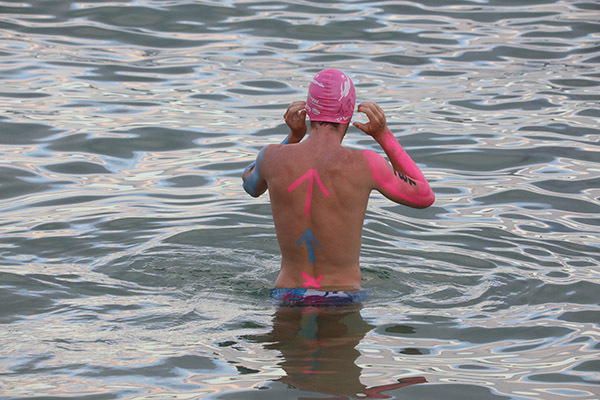 Last year’s winner and current record holder Solomon Wright made it to Thomson Bay in second place. A 3m shark was spotted off Marjorie Bay on Rottnest just after 9am. 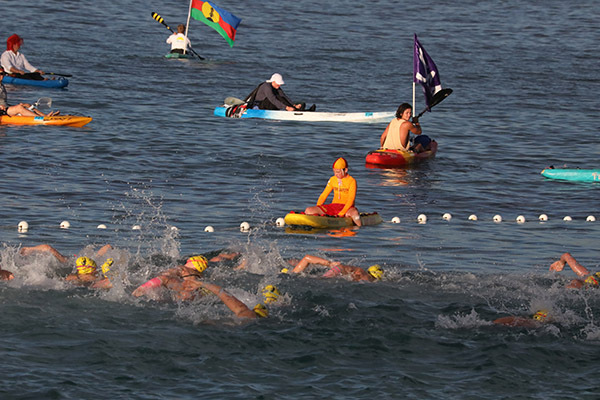 Race officials said there was no risk to swimmers as it was on the other side of the island and was sighted swimming away from the island. 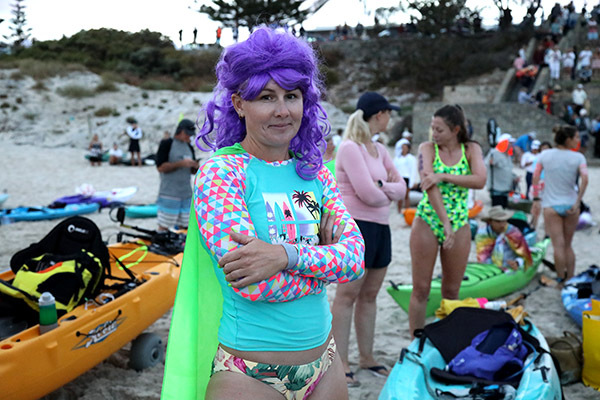 Another shark was spotted by Fremantle Sea Rescue north of the 17km mark of the course but was not thought to pose a risk to swimmers. Bunbury’s Kyle Lee, celebrating his 17th birthday today, came in third with a time of four hours, 25 minutes and 11 seconds. 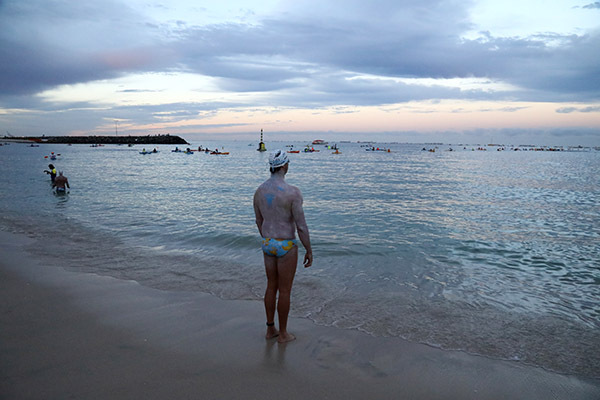 The scenario at the start in Cottesloe had a touch of the surreal at 5.30 am. 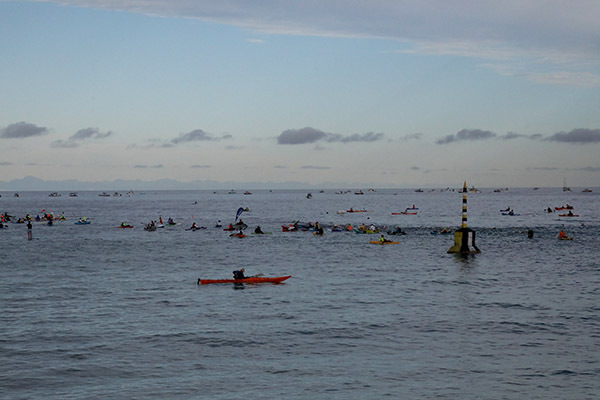 The waters beyond the Cottesloe pylon, normally open empty water were solid with a flotilla of support boats and spectator boats as 2500 competitors headed away from the mainland. 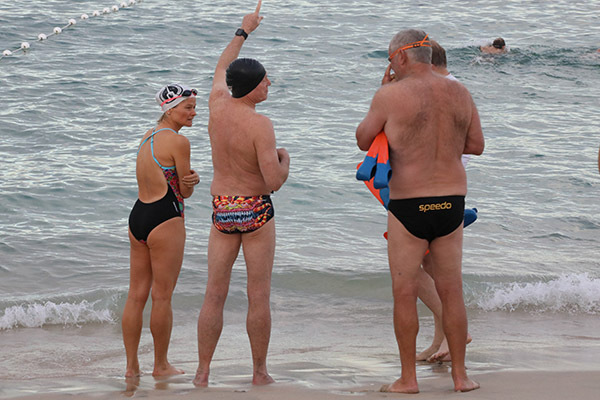 The Cottesloe beach embankments were full of supporters and early morning onlookers. The competitors, embalmed with multihued zinc cream and costumes that would not have been out of place at a Rio De Janeiro carnival added colour and vibrance to the early morning monochromatic light. The pictures in Guy Martin’s new book The Parallel State are both documentary and pictures taken on the sets of films and television shows. Combining images that are polar opposites – one of fact the other fiction – acts to create a complex narrative around the rise of fascism globally, and in particular the political climate in Turkey, where Martin lived for several years. 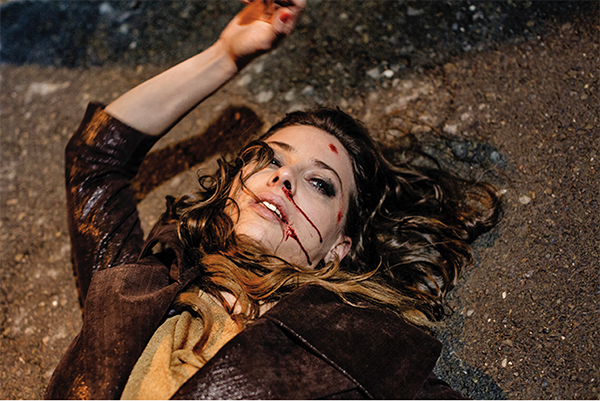 This review has been edited and reprinted from the work of Alison-Stieven-Taylor Photo Journalism Now. It is an interesting concept to use images, many of which are difficult to define, in terms of what’s real and what’s fiction, as a premise for a story about the problems that face us in an era where truth in journalism, including photography, is being questioned at the highest levels of government. In the book Martin quotes Timothy Snyder, author of On Tyranny who claims “Fascism says nothing’s true…if we don’t have access to facts, we can’t trust each other. Without trust, there’s no law. Without law, there’s no democracy.” In the pages of The Parallel State fact and fiction sit side by side in a non-linear narrative, creating a disturbing, hyperreal portrayal of what’s being played out in political arenas around the world. The divisive politics of US President Trump and the resurgence of the far-right in that country, what’s happening in Brazil with the election of far-right populist Jair Bolsonaro, the unrest in the UK and in other parts of the world, are possible because of attacks on truth. Martin makes a compelling argument that the absence of truth, or perhaps more to the point, the propagation of a particular view of reality, has also fuelled the authoritarian rule of Turkey’s President Erdoğan. 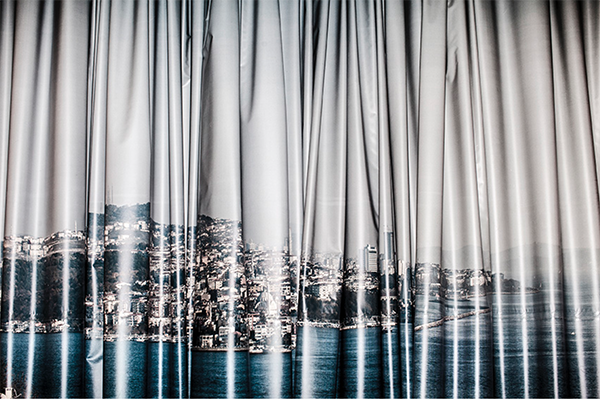 What Martin’s pictures tell us literally, anecdotally and at times in metaphors where darkened windows and opaque curtains symbolise a lack of transparency, is how authoritarianism can creep “almost imperceptibly into the fabric of a society.” And establish itself in the guise of normality. Martin wants us to ask questions of these pictures, to think critically about what we see, to consider what is truth, to look beyond the surface. It is an erudite visual conversation, one that requires an enquiring mind to understand what is being portrayed in this collection of pictures that talk of power, control, subterfuge and cultural chaos. 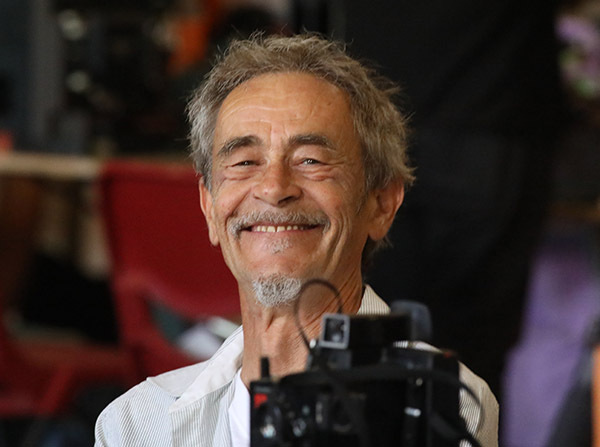 Alison Steven Taylor finds it fascinating that Martin, a seasoned conflict photographer, came to know Turkish society by photographing on the sets of soap operas and films. 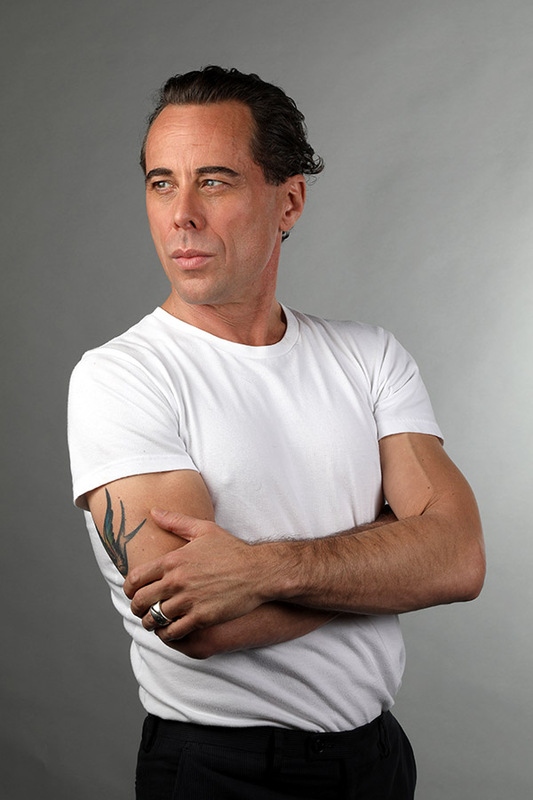 (Martin lived in Istanbul for a time after a near-death experience in Libya.) 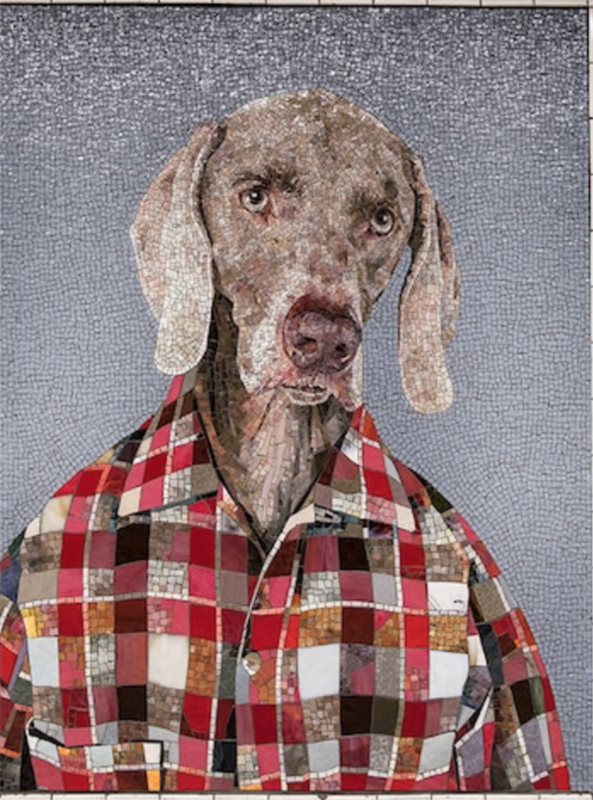 The cultural insights he’s drawn from being on set and behind the scenes, inform what is a very political narrative played out in visual tropes of pop culture. 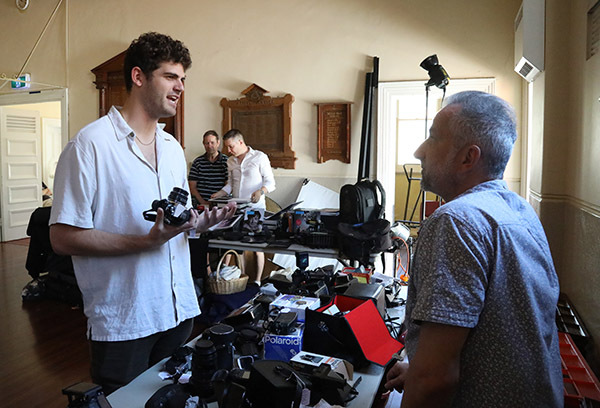 It is a brilliant treatment of a subject that is difficult to portray without deferring to what might be considered stereotypical photojournalistic imagery. 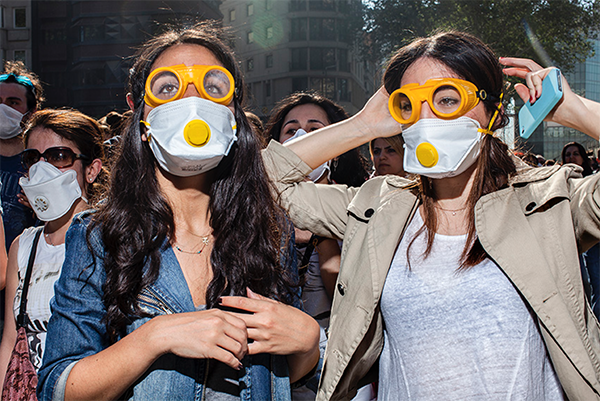 While Martin does include documentary images of protests and violence, there is the underlying sense that these pictures could also be movie stills, a blurring of art and reality in an arena where truth becomes perception. There are no captions either which further enhances the dichotomy of truth and fiction. From a design viewpoint, there are aspects of the book that Stieven-Taylor loves, like the dust jacket that unfolds to become a movie poster from the 1970s or 80s. There are also five inserted sections that are smaller than the rest of the book, and are like mini zines, printed on glossy paper when the rest of the book is on a heavier semi-matte stock. One of these inserts features a transcript from the What’s App conversation between “a group of plotters from the failed Turkish coup.” In another are screenshots of heavily made up Turkish women in western dress, the “kittens” who appear on televangelist Adrian Oktar’s bizarre TV shows. There is a collection of movie posters too that feature raunchy images of naked women, men and women with guns, lovers in embrace, from films dating back forty years. The only negative comment I have about the design is that some faces are split by the fold of the book, which is detrimental to the image and impacts the narrative. 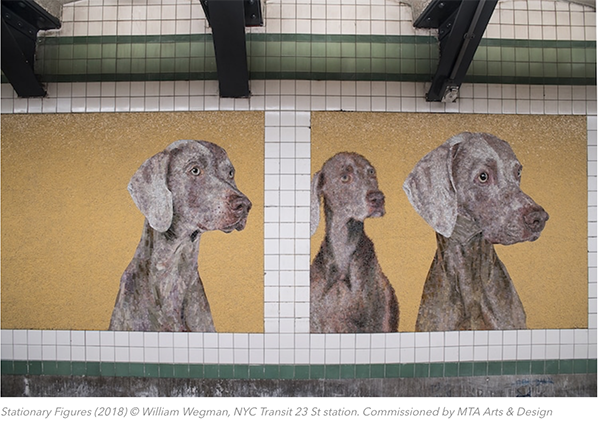 Stieven-Taylor would prefer to see a smaller complete image, but that’s a personal preference. This is a book that you need to be prepared to think about. Flicking through the images, while visually entertaining, will not allow a deeper reading. Make yourself a cup of tea, curl up in an armchair, read the essays at the back of the book and give yourself time to explore. You might need a couple of readings, but it will be worth it. 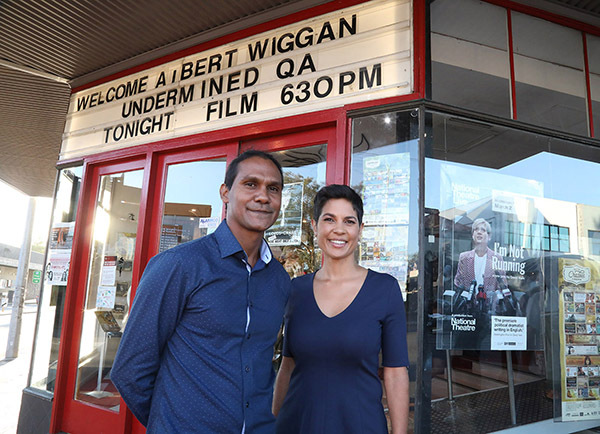 Last night’s viewing and Q and A at Luna Leederville introduced Perth to Albert Wiggin and participants in the film UNDERMINED: TALES FROM THE KIMBERLEY and provided insight into the issues affecting the people of the the Kimberley and their stories of the battles that still need to be fought to preserve a pristine treasure for Australians and the world. 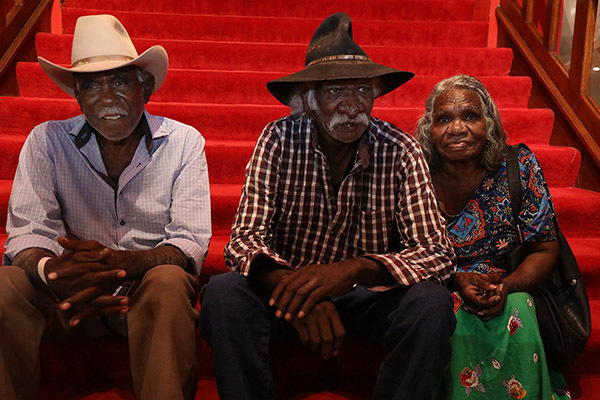 News presenter Narelda Jacobs handled the Q and A adroitly and Albert Wiggins was sensitive and lucid in explaining the issues facing the custodians of the Kimberley. 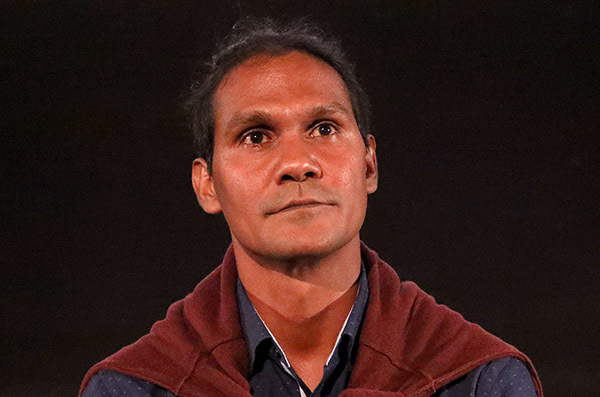 Supported by the MIFF Premiere Fund, Wrathall (Gore Vidal: The United States of Amnesia, MIFF 2013) delivers a powerful and urgent film that, while distinctly Australian, tells a sadly universal story of the David-and-Goliath battles Indigenous peoples face against development on their homelands. 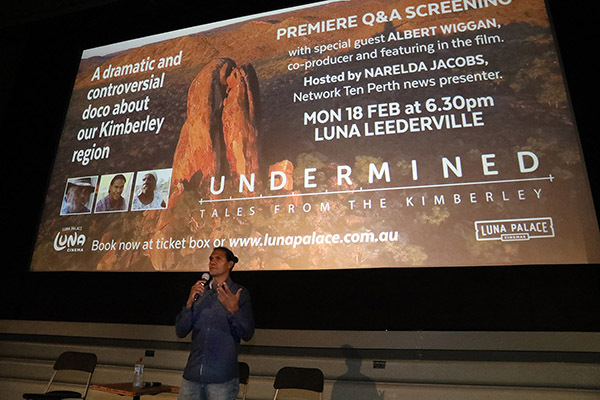 Undermined: Tales from The Kimberley asks for whose benefit is development of this scale and, ultimately, what is the path to social justice for first peoples in 2019? 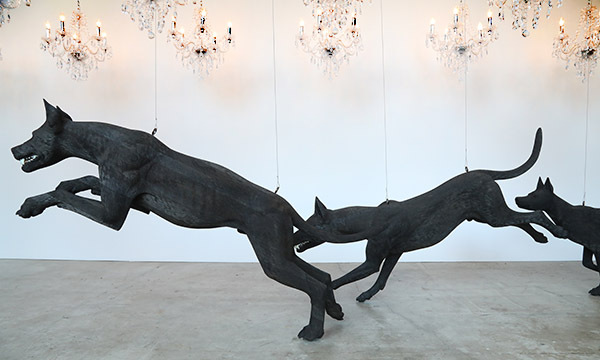 Three black Dogs strain at their leashes as they glimpse their victim across the gallery floor, their teeth set in a snarl. 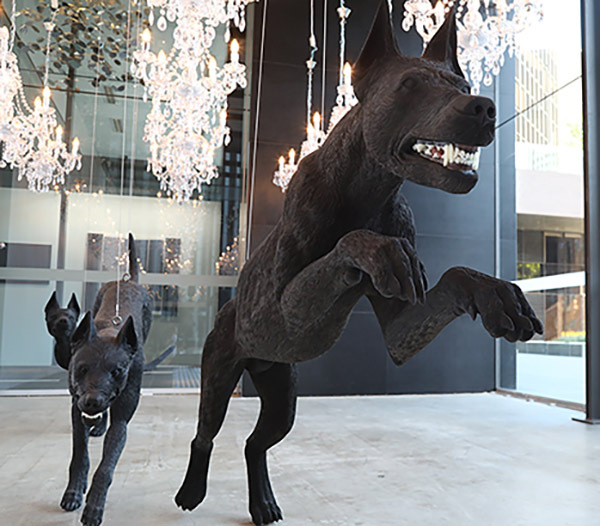 The Dogs is the latest work by Abdul -Rahman Abdullah, their menacing forms positioned by the artist beneath a row of low-hung glass chandeliers inside Moore Contemporary gallery in Perth. 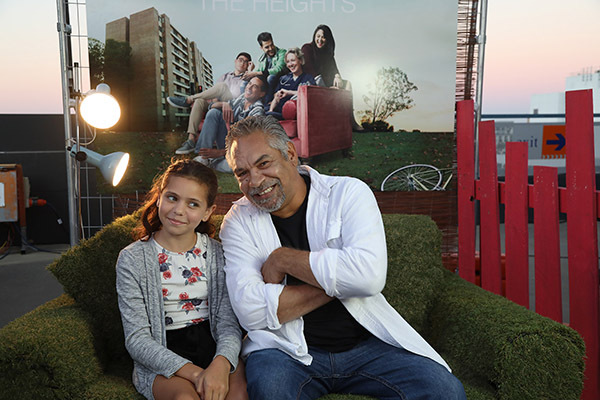 Upcoming ABC drama The Heights screened three episodes at Rooftop Cinemas in Northbridge last night prior to the launch of the series nationally on February 22 at 8.30 PM . 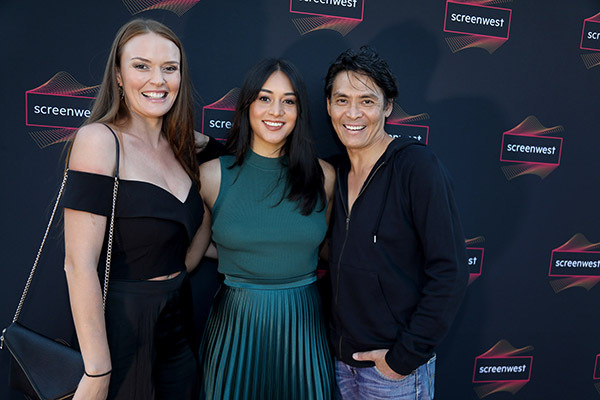 Screenwest conducted the event with cocreator Warren Clarke and producer Peta Astbury in attendance. 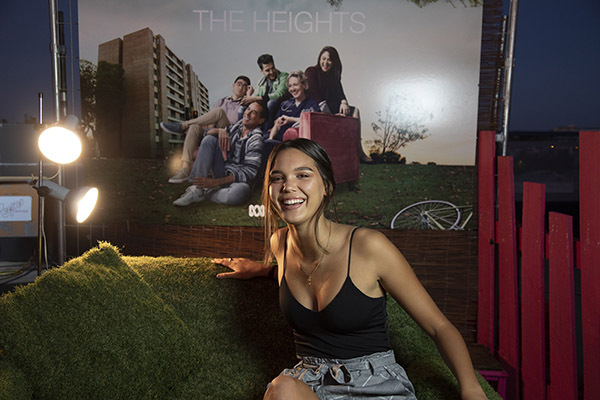 Co‐creator of the series Warren Clarke says the joy of THE HEIGHTS lies in its characters, and the way they deal with whatever slings and arrows life throws at them. “It’s a diverse community, but this series doesn’t seek to exploit the things that make us different but rather explore and celebrate the things that ultimately make us all the same. 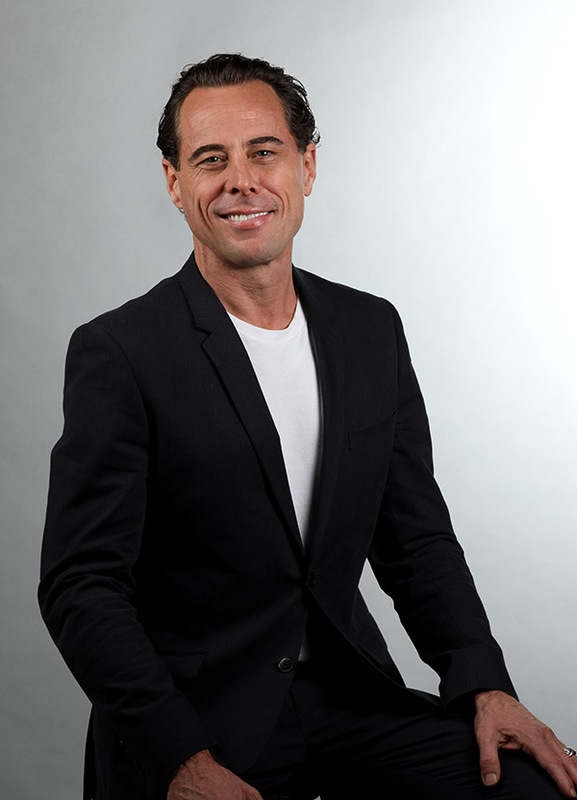 “This isn’t story about good versus evil or rich versus poor; it’s about the very unifying experience of trying to make one’s way in the world, and the family you surround yourself with, whether by bloodline or by circumstance,” he said. 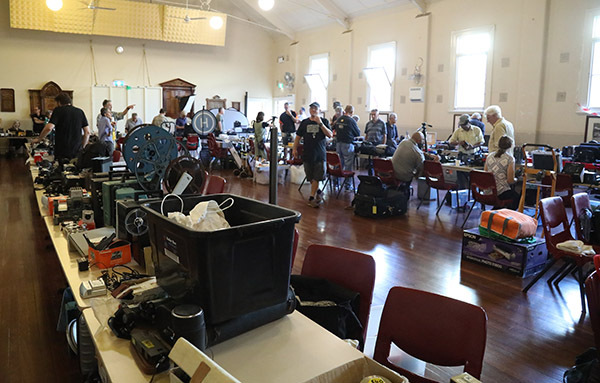 The hefty 30 part half hour drama by Matchbox Pictures in association with For Pete’s Sake Productions filmed two episodes a week using four or more handheld cameras in fully enclosed sets at Perth ABC studios and on location. 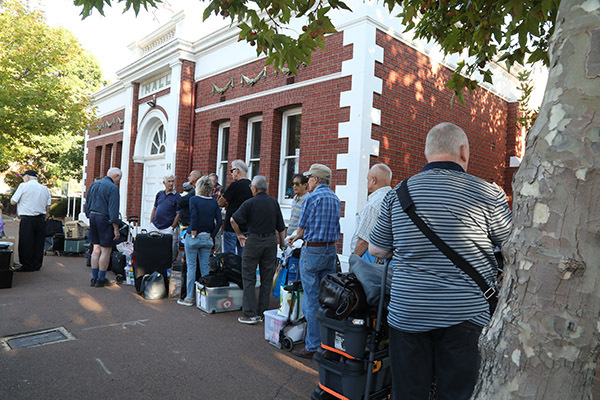 Exterior shoots at various locations around Perth were usually scheduled for one day a week, all up making this one of the biggest and busiest local productions in recent times. 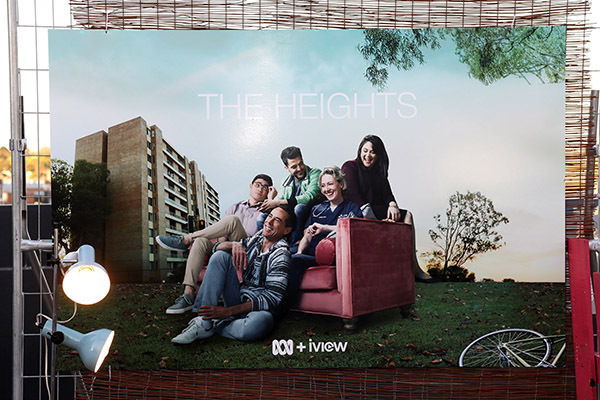 Set in the fictional suburb of Arcadia Heights, the action takes place at apartment block ‘The Towers’, and explores relationships, work lives and everyday challenges faced by its characters. 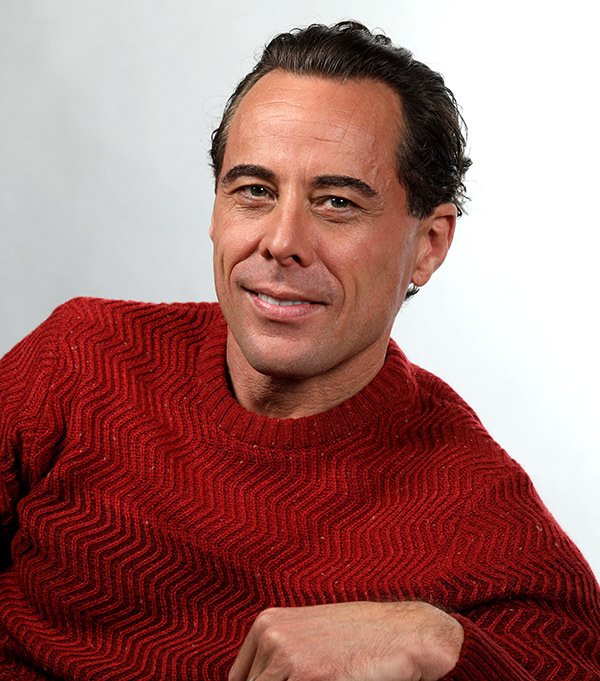 The cast features Marcus Graham, Shari Sebbens, Roz Hammond, Fiona Press, Dan Paris, Calen Tassone, Kelton Pell, Briallen Clarke, Bernie Davis, Saskia Hampele, Phoenix Raei, Yazeed Daher, Bridie McKim, Mitchell Bourke, Koa Nuen, Cara McCarthy, Carina Hoang, Melody Rom and Asher Yasbincek.